Any form is a means of getting some information from users. 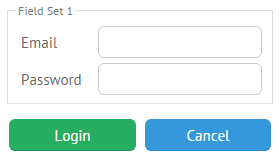 It contains input fields and select components like checkboxes, radio buttons alongside with submit/cancel buttons depending on the situation. Find them all in our Controls Guide. UI-related form inherits from view. It resembles layout very much as it is divided into columns and rows where controls are put. rows - (alias to elements) an array of vertically arranged controls and control groups. Please pay attention that in order to interact with controls (set/get values, validate them), you should specify the name property for each needed control. There exists a possibility to specify common configuration for all controls included in this or that form. However, this way is not effective while working with the whole form. element names should be concatenated from all the data names in the chain. Webix form can load or parse data like any data management component. All the data loading rules are true for it. Form elements can be divided into columns and rows with any level of complexity. Dividing a form into fieldsets. 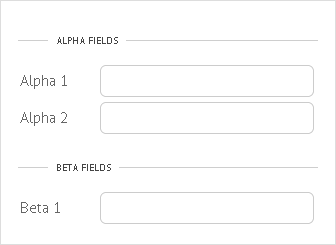 Form field can be placed into different tabs thus forming a multiview layout. Switching between tabs there is implemented with tabbar and segmented buttons as well as with the help of the dedicated tabview. The switching controls are placed directly into the array of form elements. Since form elements comprise an associative array, you can refer to each of them by the name property of any item. To get an associative array of all elements' values (name:value pairs), you can use getValues method. To get to the necessary value, you should specify the name of the needed control. getCleanValues - returns a hash of unchanged values. Any form element can be disabled or switched to the readonly mode. See also Form and HTMLform Treatment article to learn more about the most important form methods. If you want to track the moment when the value in an input changes from one to another and attach some event to it, make use of the dedicated "onChange" event. The event is attached to element object that can be retrieved by its ID or name.